That happens to me all the time and that’s the way I feel about this cable knit sweater pillow. Throughout this post, you’ll see just how easy it is to make. 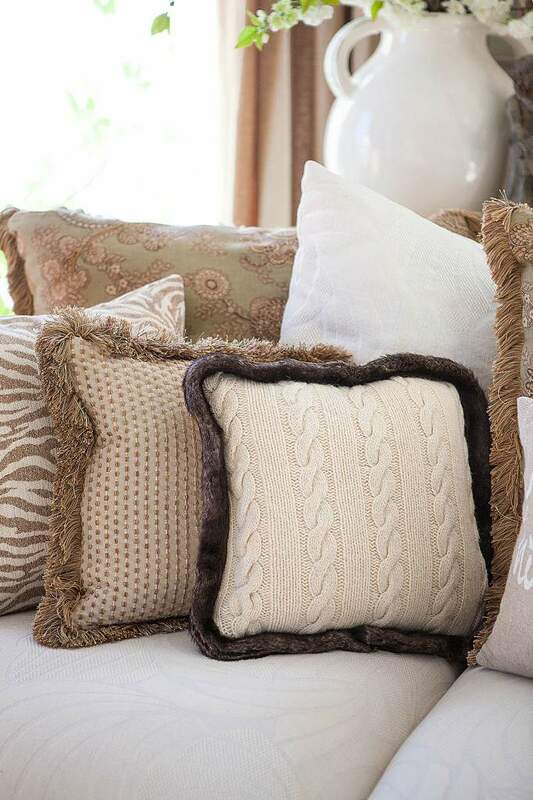 I’ve seen similar pillows in several high-end specialty stores as well as at a few big retailers like Pottery Barn and Macy’s just to name a few. Let me tell you, this is one easy pillow to make. Just grab a few old sweaters that you don’t mind cutting up. You’ll also need some fun trim. I found this faux mink trim at JoAnne’s fabric store, in the ribbon aisle. Check the size of your pillow forms because this will determine what size sweater you use. By the way, you can see a few of my other holiday-inspired pillows HERE and HERE. Because the cable knit in the sweater is a bit see-thru, I decided to make a few pillow cases first. I used ivory-colored muslin which is extremely thin and lightweight. That way, if any of the pillow peeks through the sweater… it will blend in perfectly. Measure the size of the pillowform and cut the sweater accordingly. Don’t forget to add about a 1/2-inch for the seam allowance. It’s always better to cut something like this too large because you can always trim it down if it’s too wide. Pin the faux mink trim to the around the edge of one piece of your cutout. NOTE: Make sure the two ends of the trim meet at the BOTTOM of the pillow. That way, if the two ends don’t come together perfectly, the imperfection will be concealed when propped up and no one will likely see it. In this case, I attached the trim to one inside RIGHT side of one piece of sweater cut. This will make it easier to attache the other piece of sweater because the trim won’t shift as much. Pin the second sweater cut over the first (right sides together) and stitch around the edge. Turn inside out, fold pillow in half and stuff inside the new form and then hand stitch the opening closed. I think the faux mink adds just the right amount of fancy-schmancy to this simple sweater pillow project. Yup, it’s that easy… and for a fraction of the price you may find at a big retailer. So, start looking around for those sweaters.